We have a large selection of rods, reels, lures, fishing apparel, tackle boxes, lines, sinkers and much, much more to get you outfitted with everything you need to make sure you're properly equipped for all your fishing needs! A hunter needs many things before embarking upon his or her excursion and Wings is committed to making sure our customers have exactly what they need. We also provide all MNR licensing options for your convenience! We have the largest selection of moccasins and furs around! 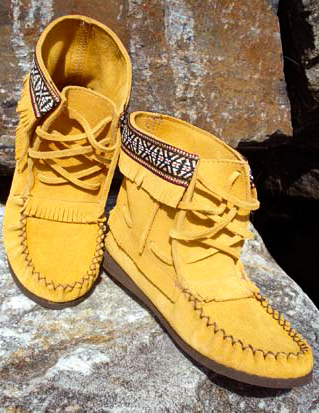 The moccasins and boots we carry are hand crafted out of leather, suede or wild moose hide. Each creation answers to its mission: for outdoor or indoor use, for the traditional snowshoe walk, by the fireside or for daily activities. BOAT RENTALS, CAMPING GEAR, FURS, SEASONAL CLOTHING & MUCH MORE! Need to rent a canoe or kayak for the day? We do that! We also have much more outdoors equipment than we could ever list here on the website! Not sure if we carry something, go ahead and give us a call!